Explore your Metrorail, Streetcar and regional rail options. 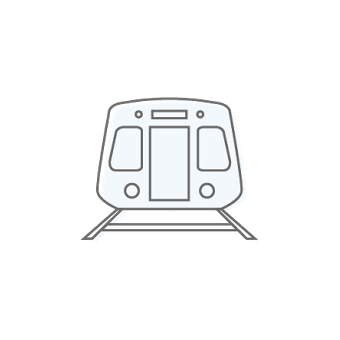 Every day, Metrorail services more than 800,000 passengers in the DC metro area. 57% of DC employees live less than three miles away from a train station. 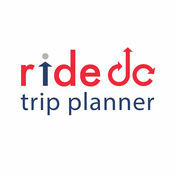 Set aside up to $260 per month before tax toward the use of public transportation (Metrorail, MARC, VRE, Amtrak, etc.) and save up to 40% on your commute to work. Ask your employer about the pre-tax transportation benefit. In its first year of service, the DC Streetcar serviced more than 855,000 riders. The Metrorail system is the second busiest in the United States, serving 91 stations in Virginia, Maryland and the District of Columbia. At the end of 2016, WMATA’s Metrorail received more than 179,693 million trips. Metrorail provides safe, clean, reliable transit service for more than 600,000 customers a day throughout the Washington, DC area. 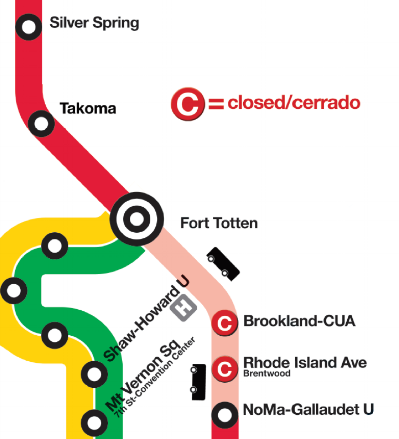 Six color-coded rail lines: Red, Orange, Silver, Blue, Yellow and Green make it possible to travel between any two stations with no more than a single transfer. Visit WMATA’s website to order Metrorail passes online. SmarTrip® cards—which can be loaded and used on nearly all area transit—can be purchased there as well. 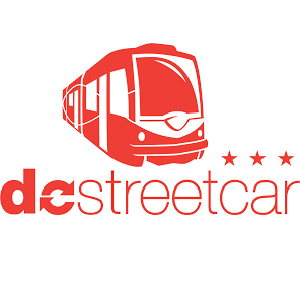 The DC Streetcar is a surface streetcar network in Washington, DC. 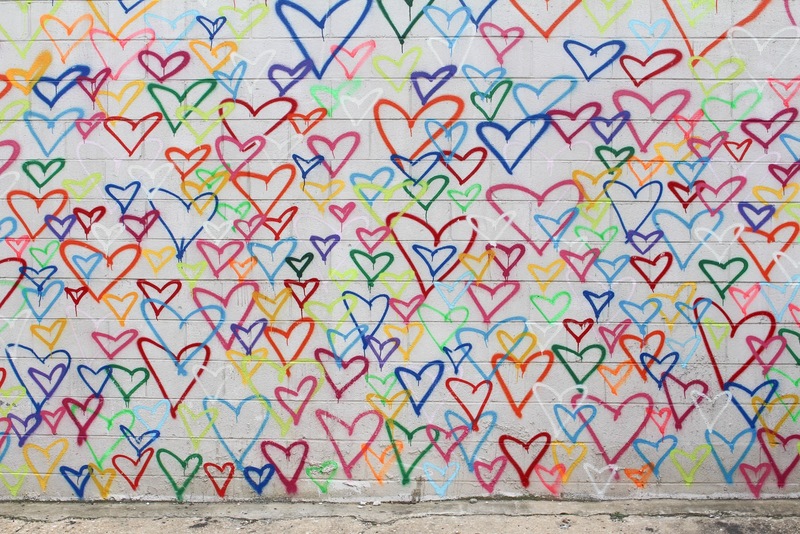 It consists of only one line—a 2.2-mile segment running in mixed traffic along H St and Benning Rd in the city’s Northeast quadrant. Operated by the Maryland Transit Administration, the MARC train provides service to nearby Union Station from Harford County, MD; Baltimore, MD; Brunswick, MD; Frederick, MD and Martinsburg, WV. MARC operates the Penn Line, Camden Line and Brunswick Line Monday through Friday, with stops at over 40 stations. For complete information about schedules and fares, visit MTA.Maryland.gov/Marc-Train. The Virginia Railway Express (VRE) is a regional/commuter rail service that connects the Northern Virginia suburbs to Union Station in Washington, DC, via two lines—the Fredericksburg Line from Fredericksburg, VA, and the Manassas Line from Broad Run/Airport station in Bristow, VA. The Fredericksburg Line includes stops in Fredericksburg, Leeland Road, Brooke, Quantico, Rippon, Woodbridge, Lorton, Franconia/Springfield, Alexandria, Crystal City and Union Station. The Manassas Line includes stops in Broad Run Airport, Manassas, Manassas Park, Burke Centre, Rolling Road, Backlick Road, Alexandria, Crystal City, L’Enfant and Union Station. For complete information about schedules and fares, visit VRE.org. 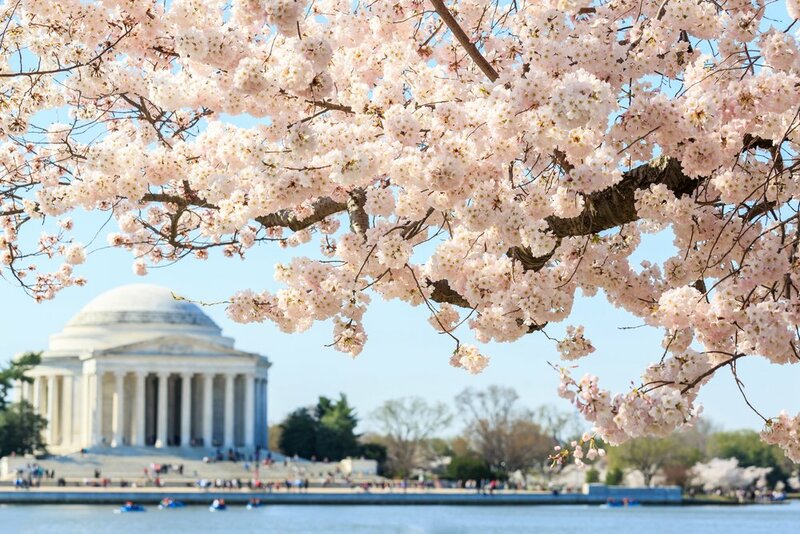 Amtrak provides passenger railroad service regionally and beyond with arrivals to and departures from Union Station in Washington, DC. For complete information about schedules and fares, visit Amtrak.com. Metrorail fares vary by time of day and the distance between stations. 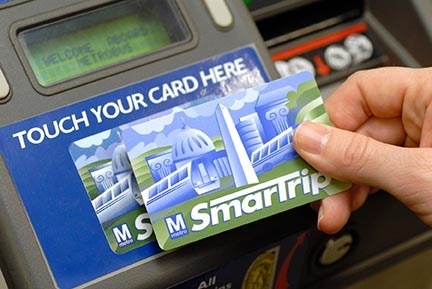 Buy SmarTrip® cards online, at any Metrorail station, or at many convenient locations. Discounts are available for rail-to-bus or bus-to-rail transfer—just use your SmarTrip® card on the bus to access the savings. Order free Metrorail, VRE and MARC riders’ guides to help plan your trip by rail. The Metrorail system undergoes scheduled trackwork during off-rush hours and weekends. Stay in the know at WMATA.com. We’ve gathered alternative transportation options and resources unique to WMATA’s BACK2GOOD program and invite you to challenge us with your commute! I’ve got good books to read. CommuterDirect is your one-stop shop for transit passes. 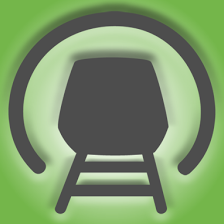 All rail passes can be purchased here. For information about projects and planning for rail transportation in the District of Columbia. Learn about commuter and employer resources, latest transit news and service alerts. Read about transportation services and regulations for the state of Maryland. For information about transit updates, projects and more in the capital region. Purchase a WMATA SmarTrip® card to be used interchangeably throughout Washington, Baltimore and the surrounding region. For information about the department meetings and projects. 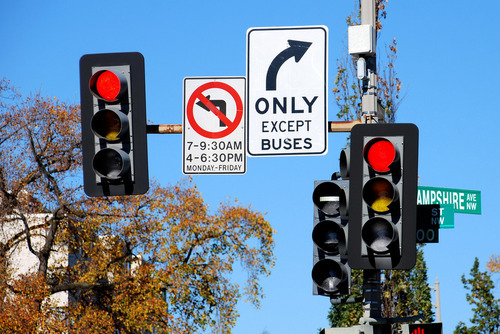 Read about transportation services and regulations for the Commonwealth of Virginia. Learn about legislative advocacy projects to enhance Virginia’s transportation systems. On January 28, 1962, the original DC streetcar made its final run. In February 2016—nearly 50 years later—the District Department of Transportation launched the first of eight new streetcar lines that will connect the city’s neighborhoods. 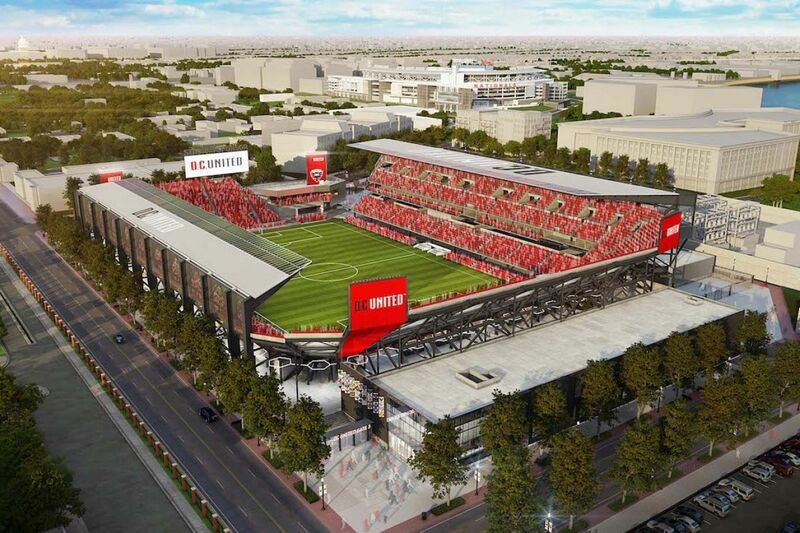 The inaugural segment, a 2.2-mile trolley line, connects Union Station and H St NE. 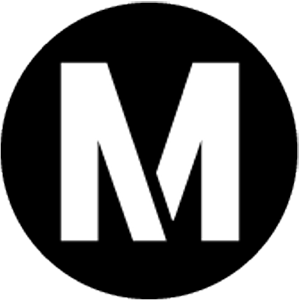 Use the service’s interactive transit map to find stops. Find out when the next streetcar is due to arrive by using the system’s real-time Streetcar Tracker. Subscribe to the goDCgo Newsletter to receive District transportation updates and information. Get a guaranteed ride home. Regularly take the train? You’re entitled to a guaranteed ride home in the event of an emergency or unscheduled overtime, courtesy of Commuter Connections. To access your four free rides a year, sign up on CommuterConnections.com. Is your SmarTrip Card prepared (to not have a negative balance)?